Detached 3 bedroom country house set in 1.7 ha of land, with outbuildings, just 10 minutes away from all amenities in the town of Bais. This property requires complete renovation but offers the potential to be a super family home . . . This dear little property requires complete renovation but offers the potential to be either . 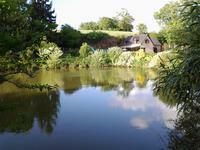 . .
Beautiful carp fishing lake close to village of Hambers with stunning selection of carp to . . . This charming property is waiting for the right person to bring it back to its former glory, . . .
A large building plot (2246m2) with potential to build two dwellings, on the edge of the popular village of Jublains. This large building plot is just at the entrance to the village, with electricity, water and . . .
Delightful 2 bedroom house with an adjacent 1 bedroom annexe and a second 2 bedroom house set . . . This traditional spacious stone 4 bedroom property is situated in an idyllic location set in . . .
Ready to move into, this detached house would make a lovely permanent home or a perfect . . .